What Else Can I Play? Clarinet Grade 3 makes learning more fun with carefully selected and arranged supplementary repertoire for today's young player. Each piece offers suggestions and guidelines to breathing, dynamics and tempo together with technical tips, performance notes and a simple piano accompaniment. 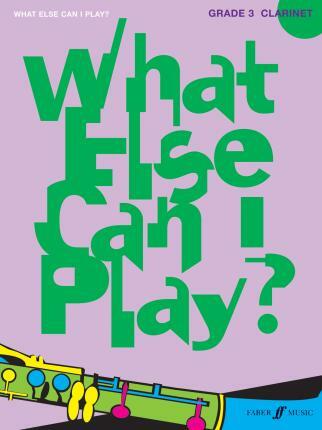 Each book in the What Else Can I Play? Series presents carefully graded pieces with a variety of musical styles ranging from classical and jazz through to showtunes and popular songs. This series will bring enthusiasm to learning your instrument and provide an entertaining alternative for those pupils who are working towards, or have recently completed exams. I Could Have Danced All Night; The Kerry Dance; Love Story (Where Do I Begin? ); Mistletoe and Wine; My Favourite Things; My Funny Valentine; My Man; Over the Rainbow; Where Is You Heart? From 'Moulin Rouge'; Speak Softly Love; Stranger on the Shore; Theme from 'The Surprise Symphony'; Thew Surrey With the Fringe on Top; Tea for Two; When You Wish Upon A Star; Yellow Bird.